Since soapstone is the softest stone and, therefore the easiest to carve, our Deep Ocean Green soapstone is a smart choice for beginning stone sculptors as well as the more experienced carvers. This imported soapstone has deep, rich dark green shades throughout. This stone may have minor color variations making it one of the most favored stones available. A beautiful stone when polished to a high sheen. Deep Ocean Green Soapstone Block - 4 lbs. Deep Ocean Green Soapstone Block - 8 lbs. 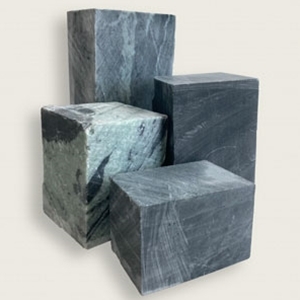 Deep Ocean Green Soapstone Block - 10 lbs. Deep Ocean Green Soapstone Block - 20 lbs.